The Variation series is the result of my continued exploration in the world of the kinetic pattering created by six overlapping wheels that orbit a common center. Each orbiting form is designed to hold a particular orientation by rotating in the opposite direction from its orbital motion. I first "discovered" this kaleidoscopic effect in my sculpture called Rhapsody and took it a step further with Quark Cotillion. This time around I've found 3 different kaleidoscopic patterns that excite me and remind me of various elements of nature. 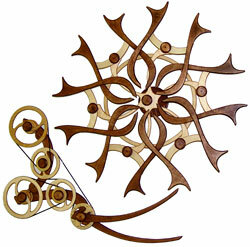 I'm going to produce this sculpture as a series with a common mechanism but different kaleidoscopic patterning wheels. The series will start with three different designs, Variation-Wind, Variation-Stars and Variation-Fire. Each sculpture in the series will be individually numbered. Variation-Wind was my first design in this series. I balanced the ellipse shape with a fan shape. It was the fan shape that gave me the "Wind" idea. Each of the fans can be thought of as a gentle breeze that combine in the center to create a hurricane of turbulence and chaos.